The research focus of Living Lab Urban:Quarters 4.0 (Reallabor Stadt:Quartiere 4.0) lies on the development of digital tools to support citizens, planners, and decision makers with the aim of creating synergies and cooperation across complex and dynamic processes in the context of digital transformation. One of the major challenges is the linking of expectations and interests, of citizens, decision makers, and market players against the background of global challenges and local diversity. Digital technologies play a key role: In order to strengthen coalitions between stakeholders, it is necessary to collect different kinds of knowledge and subsequently evaluate and integrate this knowledge into decision and planning support processes. This collective knowledge forms the basis for mutual understanding, the identification of different interests, and the consolidation of coalitions. Digital technologies’ applications are of great importance for processes bridging formal and rational knowledge with informal and implicit knowledge. Our approach aims to support the creation of knowledge for smarter, more sustainable governance of urban regions based on the experience of citizens. 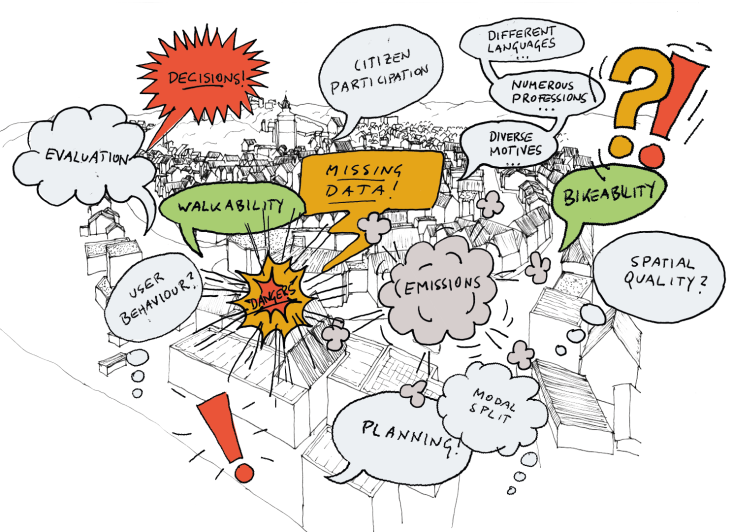 This knowledge can support planners and decision makers’ decision making and reactions to cities’ growing diversity and other markers for change at an early stage. In Living Lab Urban:Quarters 4.0, we are applying a combination of different method sets on all spatial scales (multi-scalar and multi-method approach) to develop a Digital Twin. Digital Twins are digital representations of objects from the real world. They enable comprehensive data exchange and can contain models, simulations and algorithms describing their counterpart and its features and behavior in the real world. Usually Digital Twins are created for mechanical engineering applications. Their use in urban planning and design represents a major innovation. In addition to digital technologies for supporting established methods and for participatory processes, the project also created a mechanism for linking analytical models with environmental data. We are investigating which data is useful, accessible, and, in the sense of data protection, able to be processed in order to extend the model. Furthermore, we are carrying out exhaustive data acquisition of particulate matter with the help of participating citizens in order to link observed results and environmental data (e.g. particulate matter, ultra-fine-particle, nitrogen oxides, carbon dioxide etc.) with spatial network analyses (Space Syntax) and air flow simulations. To this end, we are developing new interfaces that can better demonstrate the connection between emissions and street and path segments using network analytic data. In addition to showing the current status quo, the coupled model enables more precise prediction of planning variants. Subsequently, we are planning to link the existing models with building condition data – not only heating and cooling systems’ energy demands, but also information concerning land use and zoning for creating Urban BIM (Building Information Modelling) models. This is possible due to the COllaborative VIsualization and Simulation Environment (COVISE) software, developed at the High-Performance Computing Center Stuttgart (HLRS). Living Lab Urban:Quarters 4.0 enables visualization for different stakeholders and to support various participatory processes. For the partner city Herrenberg, we developed a complex 3D model (digital twin) which can be applied across various scales and layers of data for virtual and augmented realities. A 3D solid model of the city, supplemented by 3D scans and stereoscopic 360° videos, forms the model’s basis. In addition, we are extending the model with traffic (SUMO– Simulation of Urban Mobility) and air flow simulations (OpenFOAM) to gain a better understanding of the distribution of pollutants and the relationship to the urban grid, morphology, topography and geometry. The model was adapted with the focus on decision support for specific traffic planning projects envisioned by the city of Herrenberg. This was carried out with OpenCOVER Virtual Environment Renderer in combination with COVISE, both developed at the HLRS. Interactive models allow for the visualization and presentation of complex data, easily comprehensible for a wide audience in virtual reality environments such as the CAVE at HLRS. These facilities provide great potential for participatory processes, as different participants with differed professional backgrounds can be informed at the same time, discussions can be enhanced, and collaborative approaches toward finding solutions can be worked out. Follow-up research questions focus on how to deal with large data sets (keyword: big data), their processing, the possibilities for interface connections, analysis and simulation, as well as visualization. In this context we have to focus not only on the quality of data and its compatibility, but also the transferability of methods, analysis and collection of data on other cities of various size.